The Coutale Sommelier corkscrews are designed by Philippe Bernède, French winemaker, vintner and owner of Clos La Coutale. Over the years he became increasingly frustrated by the poor quality of the corkscrews that crossed his path. After a day of struggling to open his wine at a tasting he set out to create his own! Et voila! The first Coutale corkscrew was born! Coutale Sommelier is now a complete line of corkscrews. The French patented spring-loaded double lever adds ease, control and power to your uncorking experience. Coutale Sommelier is the ONLY spring-loaded double lever corkscrew. OUR GUARANTEE - All Coutale Sommelier corkscrews are backed by a lifetime guarantee. We stand by our product as the ONLY French Patented spring-loaded double lever and the most aesthetic and utilitarian double-lever waiter's corkscrew on the market. All Coutale Sommelier corkscrews are backed by a lifetime satisfaction guarantee. Message us through Amazon with any questions you may have and we promise to always answer within 24 hours. THE ONLY FRENCH PATENTED SPRING-LOADED DOUBLE LEVER - The Coutale Sommelier range of corkscrews are the ONLY patented spring-loaded double lever corkscrews on the market. Patented by Philip Bernède, French winemaker and owner of Clos La Coutale winery in Cahors, France, The Innovation by Coutale Sommelier is the fine tool of Coutale Sommelier's extensive waiter's corkscrew range. With a smooth grip and automatic knife closure the Innovation is the sommelier's tool of choice. AUTOMATIC KNIFE CLOSURE - Exclusive to the Innovation line of Coutale Sommelier corkscrews is the Patented auto knife closure. After cutting the foil the knife automatically closes when the lever arm is lifted! The automatic knife closure combined with the double lever adds control and safety to your uncorking experience. SOLID STAINLESS STEEL FRAME AND HANDLE - Our Innovation Stainless Steel by Coutale Sommelier is built on a Solid Stainless Steel with a matching, smooth Stainless Steel handle. The end product? A corkscrew that is as aesthetically gorgeous as it is a fine tool. Made of practical lines, The Innovation Stainless Steel by Coutale Sommelier is as comfortable opening 100's of bottles a night as it is on display at home. TEFLON-COATED WORM - The Innovation line of corkscrews by Coutale Sommelier features a Teflon-coated worm. Not only is the worm gorgeous - crafted from a single piece of stainless steel and fitted in a coat of Teflon- but furthermore it is practical. The Teflon coating assures the worm spirals into the cork smoothly, allowing for less screwing force and a smoother cork pull. 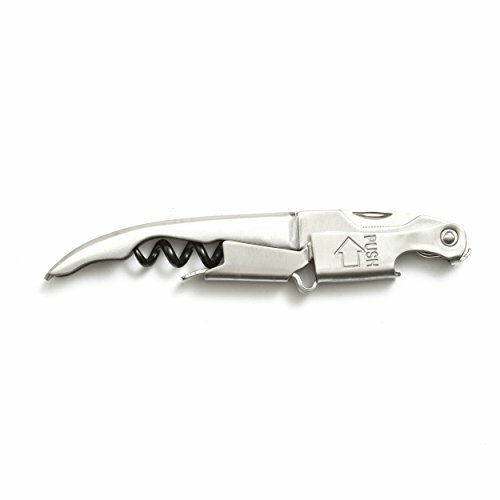 STAINLESS STEEL SERRATED KNIFE - The Innovation line of corkscrews comes equipped with a Stainless Steel Serrated Knife. Unlike the dull standard-issue knives on most corkscrews our Stainless Steel Serrated knife cleanly cuts the foil, allowing for an even cut across the foil and a clean removal. No more torn foils with the Innovation Stainless Steel by Coutale Sommelier.